EDIT: This answer was posted a long ago, and the htmlDecode function introduced a XSS vulnerability. It has been modified changing the temporary element from a div to a textarea reducing the XSS chance. But nowadays, I would encourage you to use the DOMParser API as suggested in other anwswer. // Then grab the encoded contents back out. The element never exists on the DOM. Basically a div element is created in memory, but it is never appended to the document. On the htmlEncode function I set the innerText of the element, and retrieve the encoded innerHTML; on the htmlDecode function I set the innerHTML value of the element and the innerText is retrieved. Check a running example here. The jQuery trick doesn't encode quote marks and in IE it will strip your whitespace. Based on the escape templatetag in Django, which I guess is heavily used/tested already, I made this function which does what's needed. It's arguably simpler (and possibly faster) than any of the workarounds for the whitespace-stripping issue - and it encodes quote marks, which is essential if you're going to use the result inside an attribute value for example. It gives identical result string to the builtin replace chains above. I'd be very happy if someone could explain why it's faster!? They add a couple of refinements - they appear to be handling an obscure Unicode issue as well as converting all non-alphanumeric characters to entities. I was under the impression the latter was not necessary as long as you have an UTF8 charset specified for your document. 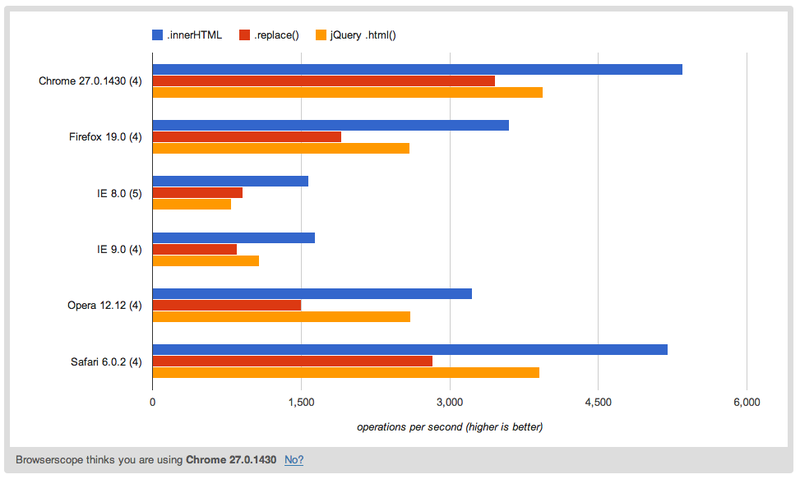 Here's a non-jQuery version that is considerably faster than both the jQuery .html() version and the .replace() version. This preserves all whitespace, but like the jQuery version, doesn't handle quotes. Underscore provides _.escape() and _.unescape() methods that do this. // -> "&lt;div class="article"&gt;This is an article&lt;/div&gt;"
FWIW, the encoding is not being lost. The encoding is used by the markup parser (browser) during the page load. Once the source is read and parsed and the browser has the DOM loaded into memory, the encoding has been parsed into what it represents. So by the time your JS is execute to read anything in memory, the char it gets is what the encoding represented. I may be operating strictly on semantics here, but I wanted you to understand the purpose of encoding. The word "lost" makes it sound like something isn't working like it should. However, what you can do, is to use JS to create an arbitrary element, set it's inner text, then read it using innerHTML. You shouldn't have to escape/encode values in order to shuttle them from one input field to another. JS doesn't go inserting raw HTML or anything; it just tells the DOM to set the value property (or attribute; not sure). Either way, the DOM handles any encoding issues for you. Unless you're doing something odd like using document.write or eval, HTML-encoding will be effectively transparent. If you're talking about generating a new textbox to hold the result...it's still as easy. Just pass the static part of the HTML to jQuery, and then set the rest of the properties/attributes on the object it returns to you. you will get chalk%20%26%20cheese. Even spaces are kept. This is from ExtJS source code. .htmlEncode() will be accessible on all strings once defined. I ran into some issues with backslash in my Domain\User string. The result does not encode apostrophes, but encodes the other HTML specials and any character outside the 0x20-0x7e range. // gives: "&lt;h1&gt;this is HTML&lt;/h1&gt;"
Using some of the other answers here I made a version that replaces all the pertinent characters in one pass irrespective of the number of distinct encoded characters (only one call to replace()) so will be faster for larger strings. It doesn't rely on the DOM API to exist or on other libraries. What are valid values for the id attribute in HTML? What is the purpose of the “role” attribute in HTML?